These sweet potato fries are unbelievably tasty! Try them and I bet you will prefer them to regular white potato fries. They are super-easy to make, full of flavour and friendly on your blood sugar and digestion. First cut the potatoes in half. Then cut these halves into ½ inch/1cm slices lengthways. Then cut each of these slices into even slices that resemble French fries. Put them in a bowl, drizzle the oil in and mix them thoroughly to coat the fries evenly. Transfer the fries to a foil-lined baking sheet and pop in the middle of the oven. Remove when cooked, season with sea salt and pepper if required and try to wait until they’ve cooled a little to devour them! 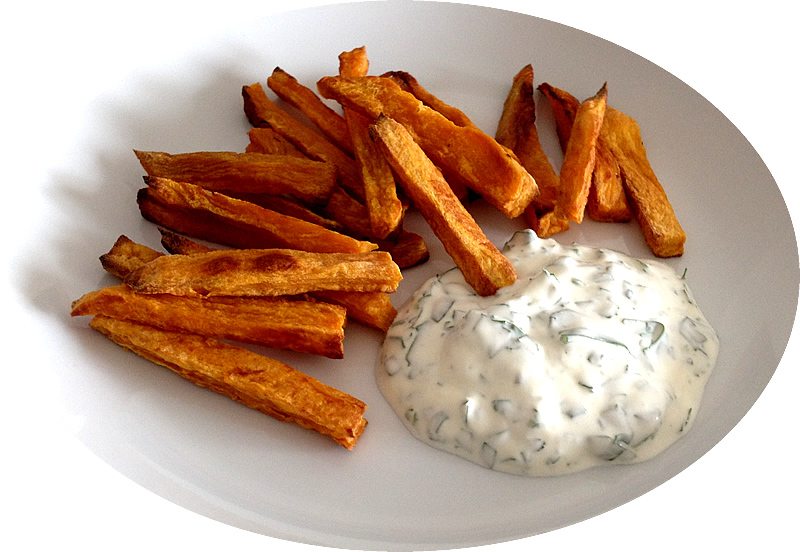 Tip: These [un]fries are amazing with a simple dip of natural yoghurt or sour cream. You can add herbs such as coriander (cilantro) or dill to the yoghurt and they also taste great with a little curry powder mixed in with the dip.